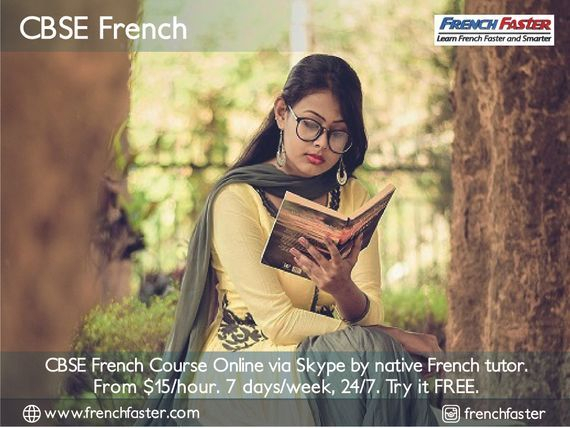 French Faster provides online preparation and revision classes for the CBSE French exam. Try it FREE! Our CBSE French tutors are very familiar with the CBSE French course and they are all experienced in preparing students for the CBSE exam. All our CBSE French classes, lessons and courses are delivered with a native French tutor via Skype. Take our CBSE French lessons anytime - morning, afternoon, evening and night classes available. Our CBSE French tutors are available 24 hours a day, 7 days a week! Why choose French Faster to prepare for the CBSE French exam? Experienced bilingual tutors: You learn from tutors (all native speakers) who know exactly what to do to help you score well in the CBSE French exam. Latest exam questions: You get model answers for recent and past CBSE French exam questions, apart from our own bank of mock questions. Our CBSE French program is delivered online with a private tutor. Our CBSE French tutors are qualified native French speakers who bilingual in French and English. Our CBSE French tutors have good experience preparing students for the CBSE French exam. Our CBSE French tutors use our Accelerated Learning method for faster progress. Our CBSE French tutor is entitled to a 5 min break after every 55 min of classes. We send you the CBSE French learning materials (pdf documents) before the lesson. The CBSE French lessons are specifically designed for online learning. The CBSE French Exam is an exam organised by the Central Board of Secondary Education in India. The CBSE French exam is taken as an examination subject at the end of Class X and IX. Students from more than 5000 CBSE schools in India and abroad chose French as a Second Language in Class 9 and Class 10. The CBSE French exam is especially popular among Indian students based in Dubai, Malaysia, Oman, Qatar and Singapore.